You can make impeccable garlic asparagus, with the perfect amount of crunch and flavor. It’s a very quick and easy side – ready in less than 20 minutes. This side dish compliments my cedar plank salmon – you should try them together! This recipe was originally posted March 4 2016, we’ve tweaked it a bit since then. This post may contain affiliate links. Read my disclosure policy here. This asparagus recipe had been my “go to” side for years. It’s super simple, healthy, and quick. My favorite part about this dish is the flavorful hint of garlic. 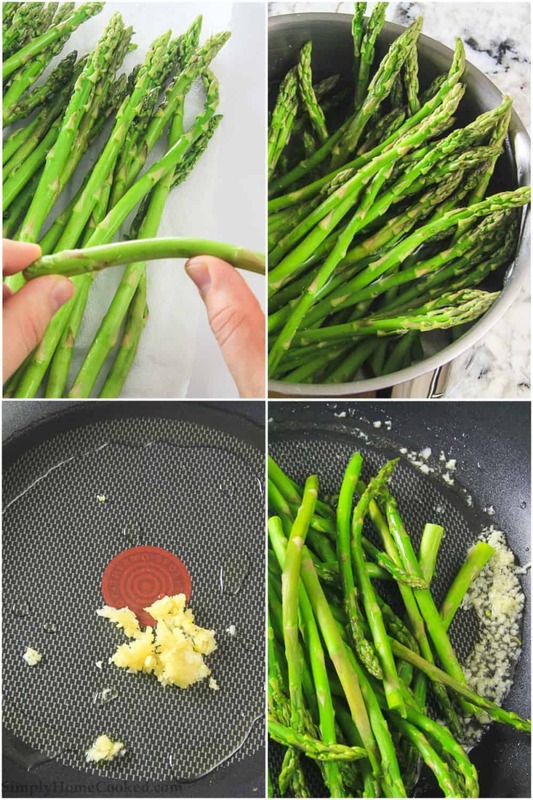 When making garlic asparagus most people like to add the asparagus straight into the skillet. I prefer to blanch the asparagus in hot water beforehand. The asparagus cooks faster in the skillet if it’s been blanched. My garlic asparagus recipe turns out with the ideal texture and taste if you do a few things before frying it in the skillet. Prepare the asparagus for cooking by snapping off the bottoms first. Discard those stiff ends – they distract from the really tasty top of the vegetable. Next, blanche (or quickly boil) the asparagus. Put them in a pot of boiling water for just 2 minutes. You’ll see them turn a very bright shade of green. Take them out immediately and dump out the water so they don’t cook any longer. Here’s a quick overview of the recipe. Full details are at the bottom in the recipe card. Prepare the asparagus by snapping off the ends. Saute the garlic in a skillet first. Add the asparagus next, cooking until tender. There are so many ways to cook asparagus. I’ll list some of my favorites because I think they turn out the best. 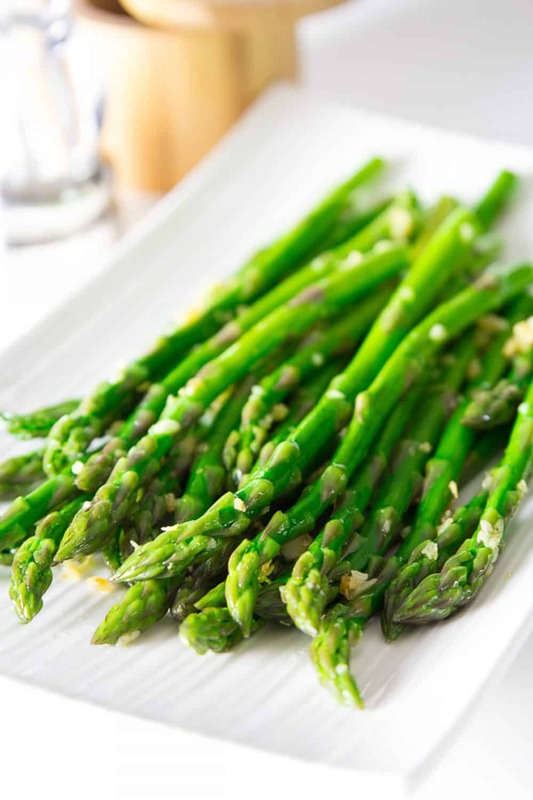 Steamed– Place the asparagus in the steamer basket, over boiling water. Steam for 5-8 minutes, when they turn bright green and a little more tender. 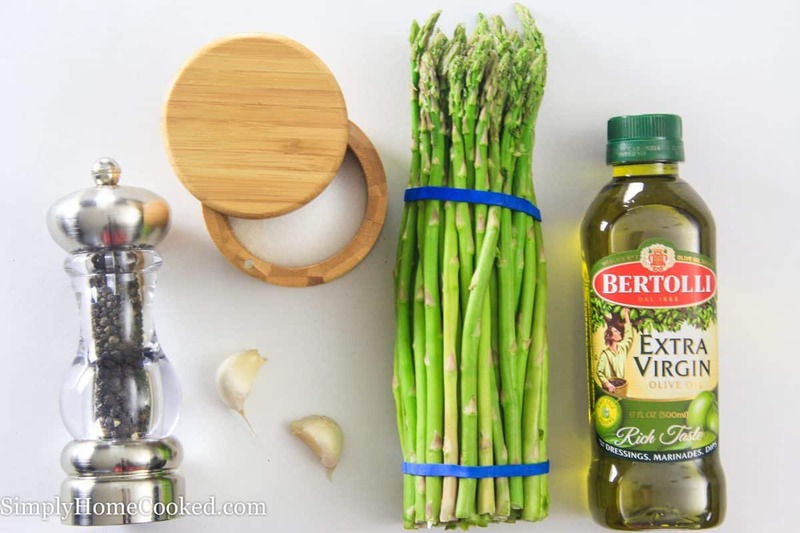 Instant Pot – Place the asparagus in a steaming basket. Add water to the Instant Pot. Set the IP to Steam and 2 minutes. That’s it! Carefully release the steam and enjoy. Air Fryer – The air fryer makes the asparagus really crunchy, so be prepared for a change in texture. Lightly sprinkle asparagus with olive oil. Set the air fryer to 400 degrees and fry for 5 minutes. That’s it! Oven Roasted – Coat the asparagus with olive oil, salt, and pepper. Bake in a preheated oven at 425 degrees for 12 minutes. Yes, you can! Freeze raw asparagus, not cooked. To freeze asparagus, first, blanch it. Blanching it helps it last longer and stay preserved in the freezer. Then, lay out the blanched veggies in a single layer on a cookie sheet. Place the cookie sheet in your freezer for about 2 hours. After the asparagus is frozen, place them in freezer bags and put them back in the freezer. They will last about 3 months in the freezer. You can make impeccable garlic asparagus, with the perfect amount of crunch and flavor. It's a very quick and easy side - ready in less than 20 minutes. Rinse the asparagus with cold water. Snap off the bottom of each asparagus spear and discard the ends. In a pot of boiling water, blanch the asparagus for about 2 minutes. Then pour the hot water out to prevent the asparagus from cooking any further. Heat olive oil in a skillet over medium heat and stir in the minced garlic for about 1-2 minutes. Add the blanched asparagus to skillet and cook until tender. 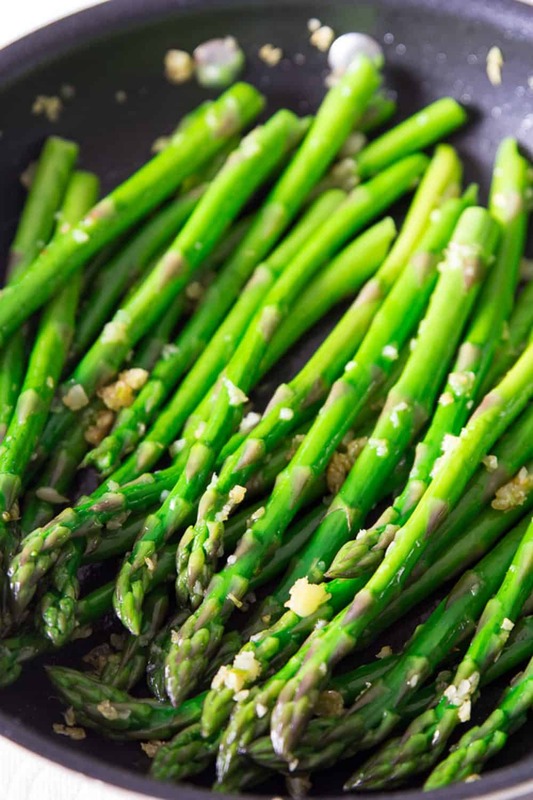 What do you serve with crispy, savory, garlic asparagus? Try one of these hearty dinner ideas. Wow! I love this recipe. I always had a hard time with making asparagus. either I over cook it or under. This one is perfect! Still has that crunch and yet soft. Perfect! Thank you so much! Your asparagus is soo yummy!